(a) Radiation and reactor theory and calculations. (b) Applications of radiation beams for pure and applied research. (c) Applied chemistry in nuclear and radiation related fields. (d) Radiochemical research for medical isotope and radiopharmaceutical development. The R&TD output (roof), based on these core activities, is targeted towards one of the following Strategic Impact Areas: Nuclear Reactor Science & Technology, Medical Diagnostics and Therapy, Nuclear Instrumentation and diagnostics, Clean Energy, Material Beneficiation, Waste R&D and contributions to the National System of Innovation (NSI). All the Impact Areas are linked to the National Development Plan. R&TD’s role in the NSI is in support of a knowledge economy with specific emphasis on nuclear and radiation expertise and their wide range of high technology applications. Contract research (right pillar) helps to sustain research and technology development in line with NSI expectations. A systems engineering approach to product development is followed and the core science and technology activities are supported by sound project and program management principles (left pillar). 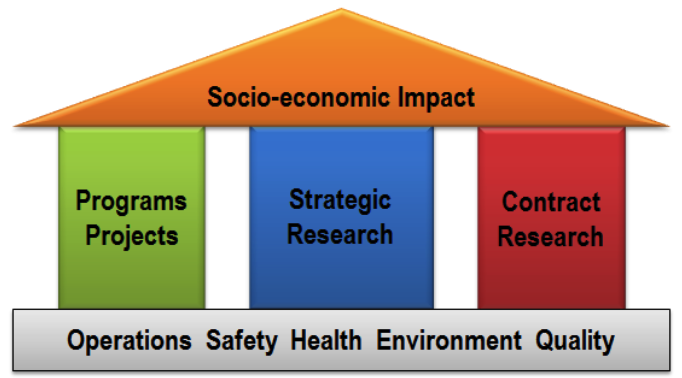 Operations management supports effective implementation and Safety, Quality, Health and Environment is of uncompromising essence to R&TD (foundation). Close collaboration with national and international collaborators to benchmark and strengthen own capabilities is sought after and nourished. The Radiation Science Department consists of an experimental Beam Line Sciencegroup and a theory/calculations group called Radiation and Reactor Theory. The Beam Line Science group utilises X-ray, gamma ray, neutron and charge particle beams to non-destructively investigate properties of materials - as well as of complex objects (such as archaeological artefacts) - for physical, chemical and structural information at atomic, mesoscopic or macroscopic scale depending on the nature of the information required.